Two of our grandchildren were visiting so we decided to take them to Muscoot Farm (one of them had already been, but it was some years ago and she didn’t remember it). Muscoot Tavern is a place for people who like a story. Bright red and oddly shaped, the restaurant, positioned at an angle and tucked away from the intersection of Routes 35 and 100 in Somers, has been in business since before 1925. 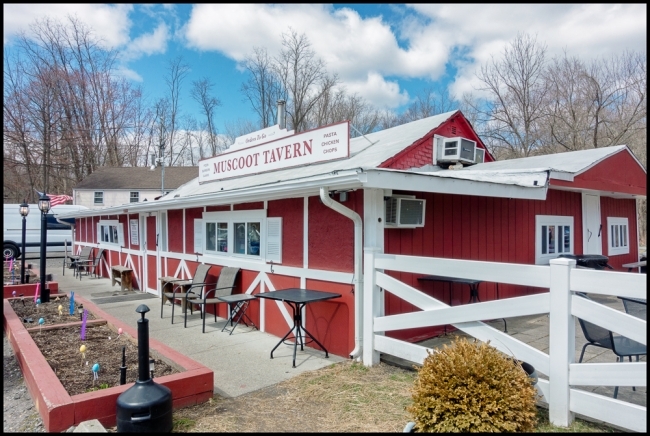 Helmed by a series of owners and called Muscoot Diner, Muscoot Restaurant, Muscoot Inn — and for a short, wayward time, Little Brauhaus — the Scoot, as it is affectionately referred to by local residents, was taken over last year by Ann-Margaret Wagner and Eddie Lubic, owner of Eduardo’s in Mount Kisco. The two gave the restaurant a face-lift with a new kitchen, fresh paint and repaired air-conditioning. But evocative details remain: terrazzo floors are worn bare by thousands of feet, bowed walls show the effects of time, and the bar looks like the meeting place it has been for countless get-togethers over the years. We ordered a kids burger for our youngest grandchild. It was enormous – almost the size of her head! If this was the kids portion I can’t imagine what an adult portion would be like. The restaurant had a nice atmosphere and service was quick and friendly. Taken with a Sony RX-100 M3. This entry was posted in Buildings/Structures. Bookmark the permalink.